Back Cover. Click on images to enlarge. Available now in paperback, e-Book and Audiobook streaming/download. for your book club -- click here! 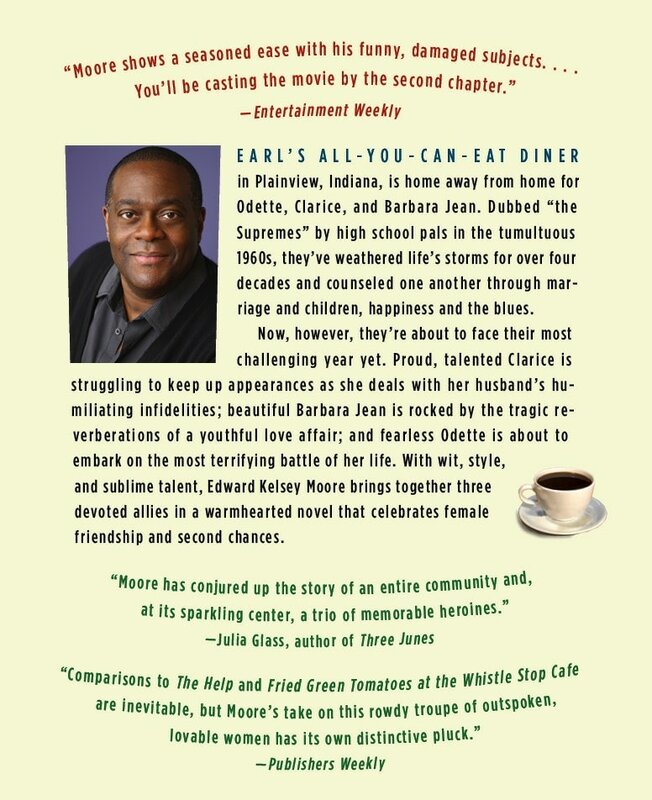 You can read an excerpt from The Supremes at Earl's All-You-Can-Eat at this Barnes & Noble site (click on the red arrow at the bottom of the book's cover image to see the excerpt) -- click here! See more book covers and details for the international translations -- click here! reading organization in the U.S. for black women. The novel was chosen by the Illinois Reading Council in 2014 for inclusion in the state-wide literacy program, ILLINOIS READS. In 2015 the book was selected by a group of six suburbs northwest of Chicago for their ComingTogether program. The theme for 2015 was: Voices of Race. During the three months of activities and presentations, The Supremes at Earl's All-You-Can-Eat helped open a cultural dialogue among the 100,000 citizens who live in the area. and spark conversation among families and communities. In 2017 The Supremes at Earl’s was selected by two counties in central Indiana for their annual One Great Read program, to promote literacy and expand community inclusiveness. Extensive programming by county libraries along with other community activities included movie screenings; a photography exhibit; a book discussion at an old-style Indiana diner; several children and family events; a writing workshop; and one workshop each on digital photo archiving and scanning your family memorabilia. Plus more than a handful of additional book discussions -- and all of it relating back to The Supremes at Earl’s All-You-Can-Eat! "Hilarious, heartwarming and poignant. . .
that is literally bursting with joy and warmth." "We laugh, we cry. . . do not worry, most people laugh. even the most flawed, shines from every page." and credits youthful eavesdropping for inspiring this multifaceted novel. lovable women has its own distinctive pluck." "The setting is Plainview, Indiana and although the exotic backdrop is an unfamiliar Southern state in America, the midlife problems of Clarice, Odette and Barbara Jean are universal. They are black women and they faced the brutality of the civil rights struggle. This makes the novel an excellent and unpreachy chance to learn how the movement affected ordinary women. But the author’s real skill is showing what a dangerous dance this kind of long friendship can be. And if the friendship is to survive, the same rules apply wherever you happen to live." "Throughout the Supremes’ intertwined stories is one constant — meeting and eating at Earl’s All-You-Can-Eat, a place where relationships are forged, scandals are aired and copious amounts of chicken are consumed. . . A novel of strong women, evocative memories and deep friendship." "Edward Kelsey Moore has written a novel jam-packed with warmth, honesty, wit, travail, and just enough madcap humor to keep us giddily off-balance. 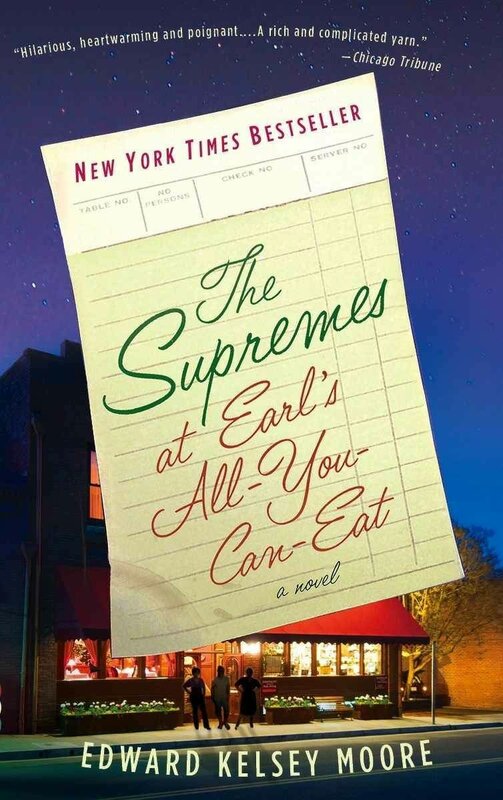 The Supremes at Earl's All-You-Can-Eat is that rare and happy find: a book that delivers not only good story, but good company." "Edward Kelsey Moore, an American cellist who swapped bow and scores for a computer keyboard is able to make us laugh and cry with this first novel, written without the slightest false note." "He captures the world of black women in the '60s. . . I should also mention that [Edward Kelsey Moore] is an outstanding writer. He should be widely read." "Breathtaking. . . The supremely gifted, supremely entertaining, and supremely big-hearted Edward Kelsey Moore has conjured up the story of an entire community and, at its sparkling center, a trio of memorable heroines." "Moore writes the interwoven stories of three Afro-American women, from the 1960s to the present. They are small-town mothers and wives, outwardly conventional, but with secrets. It could be the stuff of earnest tragedy, but Moore goes for comedy with an absurdist twist. Warm and insightful." In Paperback, e-Book and Audiobook streaming/download. ​A sequel to The Supremes at Earl's is available now! Search the Edward Kelsey Moore sites -- click here!